The Supreme Court said in Hobby Lobby that, under the Religious Freedom Restoration Act (RFRA), the Department of Health and Human Services (HHS) could not apply its contraceptive mandate to closely held for-profit corporations when doing so would violate the owners’ sincere religious beliefs. Around the time of that decision, the Court stayed the application of the mandate to a group of nuns known as the Little Sisters of the Poor. The Little Sisters—like the plaintiffs in six other cases that have now been consolidated under the name Zubik v. Burwell—object to the “accommodation” that HHS crafted for their religious beliefs and the Supreme Court will now be evaluating their claims. Here’s the deal: The Affordable Care Act tasked HHS with developing guidelines to ensure that health insurance plans provided women with “preventive care” (a term undefined in the statute’s text). Although the ACA said nothing about accommodating or exempting religious organizations from that “preventive care” requirement, which HHS interpreted to include various contraceptives (four of which Hobby Lobby had objected to), HHS established a rule that exempted churches and their “integrated auxiliaries” from the mandate altogether but required other religious organizations to submit a self-certification that would lead insurance providers or third-party administrators to cover the costs of the objectionable contraceptives. The Little Sisters, Reverend David Zubik, and the other plaintiffs believe that filing this self-certification makes them complicit in sin, in violation of their sincerely held religious beliefs. The Court granted cert. to determine whether the contraceptive mandate and the accommodation indeed violate RFRA. But a preliminary question is whether the executive departments responsible for creating the accommodation (HHS, Labor, and Treasury) had the authority to do so. The short answer is that they did not, as Cato and the Independent Women’s Forum argue in our amicus brief. The departments claim that the source of their authority is the instruction that they interpret what “preventive care” employers must provide to their employees. The departments accordingly tried to balance religious liberty and access to contraceptives by exempting churches and merely accommodating other religious employers. They justified this distinction by saying that non-church religious employers were more likely to employ people who did not share their faith or adhere to the same objection. That distinction does not hold up, however, as the case of the Little Sisters—nuns who have vowed obedience to the Pope!—demonstrates. Furthermore, there is no indication in the vast amount of ACA text delegating authority to the departments that Congress intended for them to make religion-related judgment calls, as the word “religion” does not appear anywhere in those statutes. It is particularly unlikely that Congress would have delegated, without any statutory guidance, this sort of authority given that the departments have no expertise in crafting religious accommodations. Executive agencies simply cannot impose arbitrary burdens on religious non-profits that they guesstimate to be “less” religious than churches. In the analogous area of tax exemptions, for example, an organization need only indicate on a form that it is religious—it need not prove or even claim some level of religiosity—and once exempt, it receives the same treatment as a church. That’s a good model for this case: The departments, which lack the “expertise” to answer this “major question” of social, “economic and political consequence,” to quote King v. Burwell, are simply not entitled make religious-liberty policy or receive judicial deference when they do. 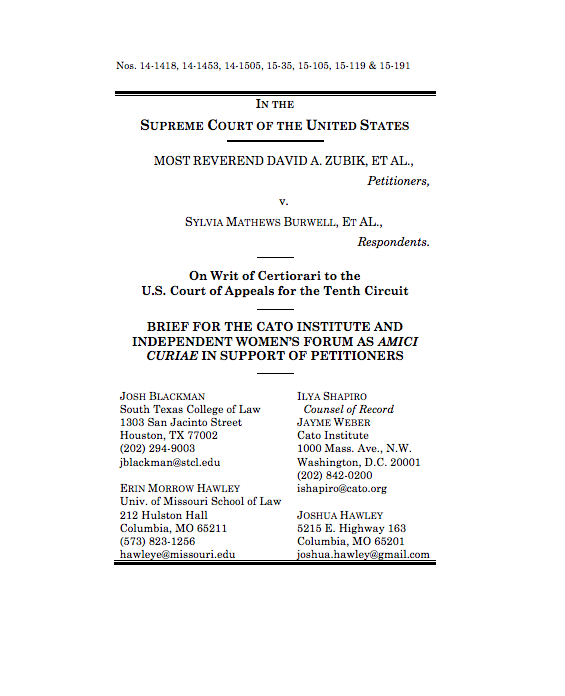 Although administrative law’sChevron doctrine allows agencies to fill in the gaps where a statute’s language is ambiguous, that power does not entitle agencies to make major decisions that alter the fundamental aspects of religious free exercise when the only potential source of that power is the term “preventive care.” Finally, where there is a lack of clear indication of congressional delegation, the Court must avoid constitutional questions that could lead to church-state entanglement, as even the government has argued elsewhere.